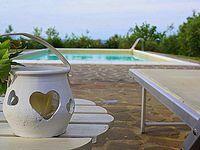 Tuscan farmhouse offering comfortable accommodation for 5 persons. Property 11: Tuscan farmhouse offering comfortable accommodation for 5 persons. Property 14: Typical Tuscan house: with garden 1000 Sqm, Panoramic Views, Wi-Fi, Fireplace. Panoramic Secluded Farmhouse with Private Pool, Air Con, Wifi among Nature! Property 15: Panoramic Secluded Farmhouse with Private Pool, Air Con, Wifi among Nature! Property 26: Top-Hill Farm-House in Pictureque Tuscan Village with Stunning Views. Beautiful Eco-Friendly Farmhouse:Cooking Lessons, Meals, Driver, Car and More ! Property 33: Beautiful Eco-Friendly Farmhouse:Cooking Lessons, Meals, Driver, Car and More ! Property 37: A small village of five beautiful apartments in the green Tuscan hills. Stefano and Marta were the best! Stefano was funny and very informative, while his wife was sweeter than strawberry wine. The property is on beautiful rolling Tuscan hills with absolutely breathtaking views. You have charming villages to explore all over Terricciola with welcoming people to give you a wonderful experience. Pisa, Livorno, and Florence are 50 kilometers away or less to visit. Again, I can&rsquo;t stress enough how amazing this place is!!!!!! Stefano is one of the funniest people alive and Marta is so sweet, you are welcomed with a bottle of outstanding wine from a nearby winery that they give you a free ticket to go for a tasting. They do everything to accommodate you and make sure you&rsquo;re happy, along with serving you oven baked pizza which Stefano makes (which is fantastic,) to a pasta lunch that is to die for! I spent 20 days there and wish I could of stayed longer and plan to rebook to stay again in the future. Lovely spacious home with plenty of room and beautiful kitchen/baths. Room outside for kids to run around which was so needed after Rome. The little walled city of Montecarlo is definitely worth a visit while there. We also ate at the owners restaurant and enjoyed it!